Jeannette Bottle Works began operation in the late 1880s in Jeannette, Pennsylvania. In 1898 the company became Jeannette Glass Company. Like so many other glassware entities, this one concentrated on utility glass early on and produced a vast selection of handmade bottles, jars, and dishware well into the early 1900s. The company expanded production to prism glass in 1917. Prism glass was incorporated in both business and residential structures to increase light exposure. This division of the company was sold in the mid-1920s. Improvements made to the factory during this period, however, included converting it to a pressed glass facility. This change allowed the company to later produce the Depression-era kitchen glass and dinnerware for which they are best known. Jeannette Glass Company, one of the seven major companies producing Depression glass, introduced 14 collectible patterns during the period from 1928 through 1938, according to an article by Joyce E. Krupey published online by the National Depression Glass Association. Among these are the ever-popular Adam and Iris & Herringbone patterns. Other Jeannette patterns include Hex Optic, Cube (also known as Cubist), Floral, Sierra, Doric, Sunflower, Windsor, Doric & Pansy, Swirl, Homespun, and Sunburst. A number of children's dish sets in various patterns were made as well. Jeannette also manufactured the Cherry Blossom pattern, which is being singled out here because it has been widely reproduced. Select pieces of Iris & Herringbone in crystal have also been reproduced in clear. Ruby Lane's "Real or Repro" site (realorrepro.com) is a good resource for identifying these reproduced pieces. Colors used in Jeannette's Depression glass vary from the traditional pink, green, and clear to a more uncommon teal blue-green color called ultramarine. They manufactured not only dinnerware patterns in these colors but a wide array of kitchen glassware as well. Their ribbed kitchenware pattern known as Jennyware was made in pink, clear, and ultramarine. Jeannette also produced kitchen glass and a limited amount of dinnerware in opaque Jadite and Delphite glass. The mark indicating a piece was made Jeannette Glass Company included a capital J enclosed by either a square or a triangle, and sometimes alone. The J is sometimes is reversed on the bottom of the piece (as illustrated here), but appears normally when seen through the bottom of a tumbler, goblet or ice cream glass. Many pieces of Jeannette glass were not marked but can be easily identified by the distinctive patterns as noted above. During the 1950s Jeannette introduced Cameo Glassware consisting of "exquisite traditional styling in gleaming milk white," according to a catalog page published in the Collector's Encyclopedia of Milk Glass by Bill and Betty Newbound. Competing with many other companies, their bowls, compotes and covered dishes looked similar to those made by Westmoreland and Fenton, although Jeanette's milk glass wares were nowhere near as plentiful in terms of the quantities produced in varied patterns. Jeanette's most popular milk glass with collectors is the company's Shell Pink line. Made in the late 1950s for a short time, this collection incorporated many different patterns and mold shapes in pale pink milk glass. 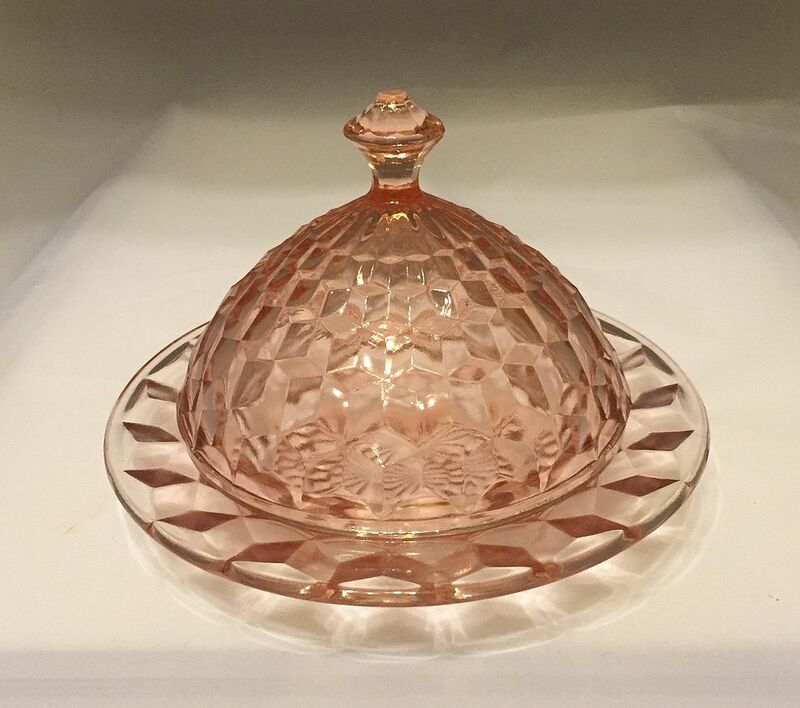 While Fenton, Fostoria, and Cambridge also had their versions of pink opaque glass similar to this, Jeanette's Shell Pink comes to mind most often when collectors refer to mid-century milk glass with a rose tint. Jeannette Glass Company hit a low point in production during World War II, but bounced back in the mid-1940s when the war ended. They purchased the McKee Glass Division of Thatcher Glass Manufacturing in 1961 and were known to operate the "world's largest electric glass furnace for melting heat-resisting glass" in the early 1960s, according to information shared on Glassian.com. In 1970, the company's name changed to Jeannette Corporation. They ceased production and closed the factory in 1983.